This family-run hotel is situated in the heart of Frankfurt, within walking distance of the Frankfurt Trade Fair, business district, city centre and museum mile. 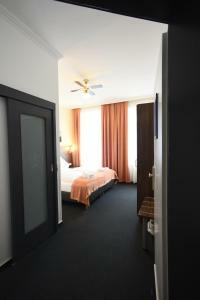 Metro Hotel Frankfurt City offers free WiFi throughout the property. The Wilhelmine-style villa offers cosy rooms with cable TV, a telephone and a private bathroom with shower. The Property offers a continental-style breakfast buffet with a rich selection of delicious delights. Metro Hotel Frankfurt City is 100 metres from Frankfurt Central Station, and just a 12 minute train journey from Frankfurt International Airport. Motorway connections are just 3 km away. Please note that the check-in address is different for the apartments: Werftstrasse 15, 60327 Frankfurt am Main.